I’m often awed by personal projects my advertising photographer peers shoot. I’ve seen fashion shooters display documentary images shot in Nicaragua, still life guys shoot action and sports at the Olympics…And often, I’m more enamored by their personal work. Being an advertising photographer has been a wonderful journey for me throughout the years. I’ve been fortunate to travel around the world and meet some interesting people along the way. I’ve been producing personal work since the beginning of my career. It’s especially rewarding to have the opportunity to produce images with my vision and the support of a great benefactor or client. I’ve been a scuba diver, lifeguard, lover of swimming pools and the water ever since I can remember. I also love a good challenge and often, I’m the guy the agency calls when there’s a challenge that needs a creative approach and solution due to a difficult environment, logistics or tight budget. 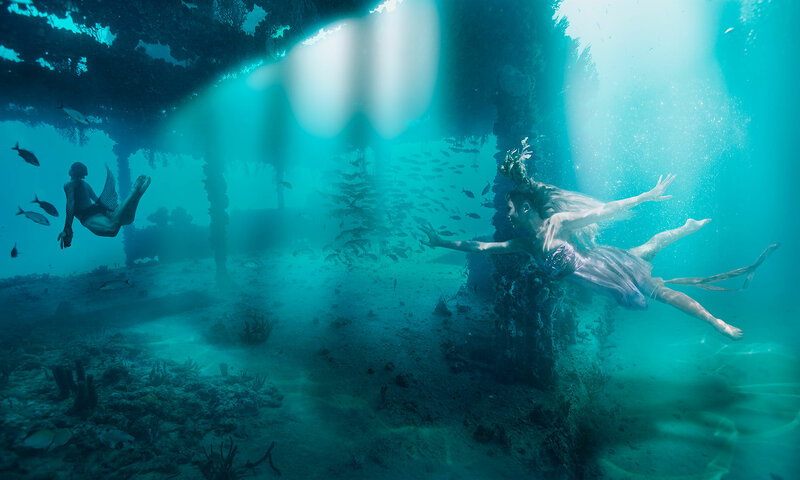 A year or so ago, I came up with the idea to shoot some underwater imagery. Not of fish and coral, but of people, playing sports, fashion, or dancing. I hadn’t yet decided what the final scenarios might be, first I had to do my homework. Shooting stills underwater sounds easy. Grab your Go Pro, jump in the ocean or pool, and there ya go! Well, that may be true for some, I wanted to shoot a story with higher quality, more thought out, with an awe factor that would leave people asking how were these done? And, at the end of the day, I wanted to end up with a stunning and unique series of images! I faced several challenges, most importantly; I had to come up with an idea that hadn’t been overdone. 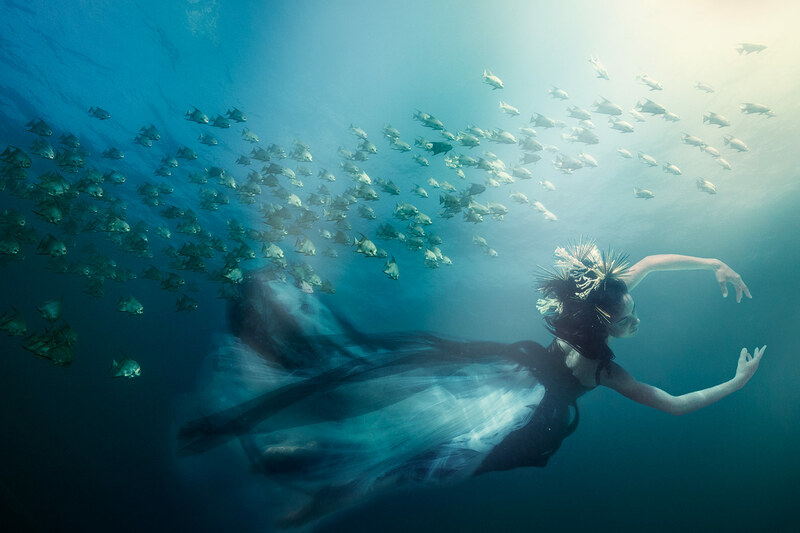 Though I love long flowy fashion, and how it looks when shot underwater, it’s been done. I wanted my shots to be more than that. I wanted the images to have an organic quality and not feel cliché’. 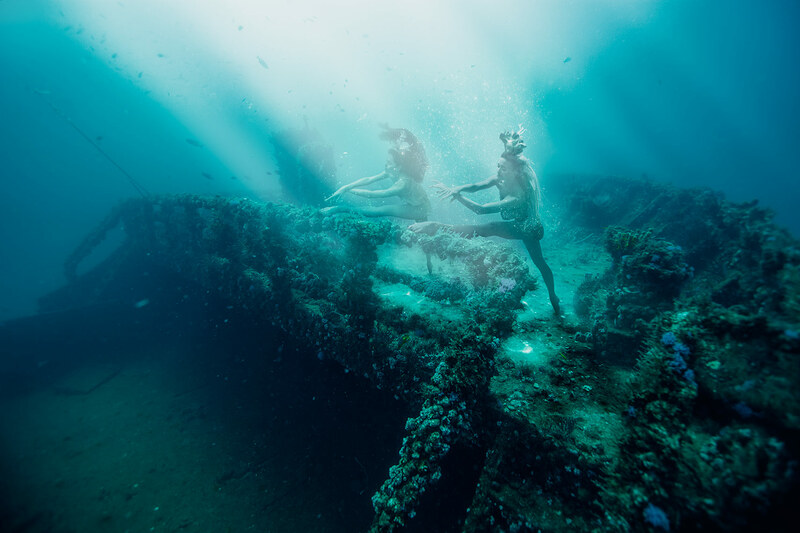 I came up with the idea to shoot underwater wrecks coupled with dancers, athletes, or to create a lifestyle situation on the wrecks with models. Once I came up with the general direction, I handled this shoot just like I do my advertising shoots. I began by doing extensive research, homework, and practice. 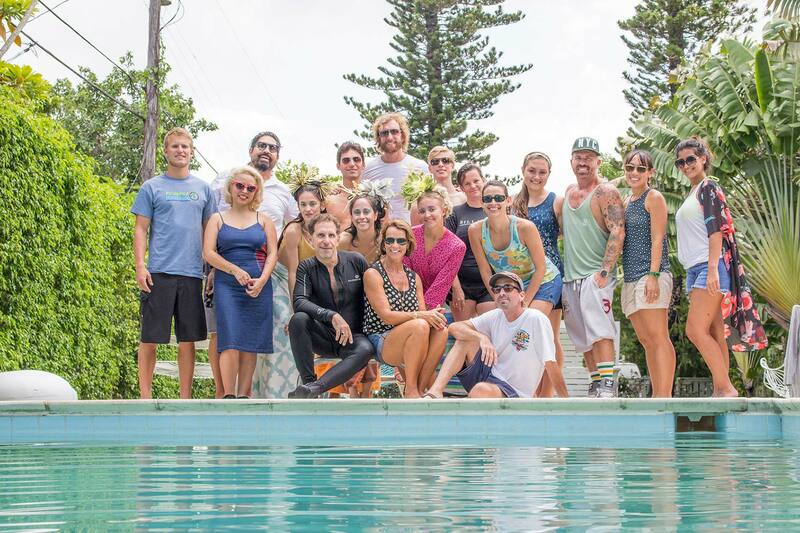 First I had to learn to shoot underwater, with and without tanks and diving gear, in a pool and in the ocean. I needed to practice in the environment with camera housings that were new to me and of course, I needed a muse that would be willing to put up with me. As I do on most of my shoots in one capacity or another, I tapped my wife to pose for me and a neighbor to allow us to shoot in their pool. Here’s a couple of my “practice shots” utilizing my wife Sherryl, my always willing muse. 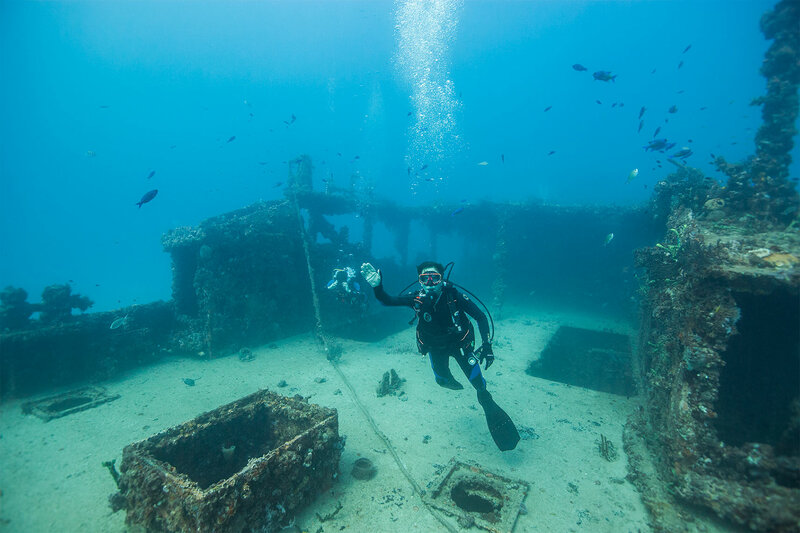 Secondly, I had to come up with a way to gain access to underwater wrecks and procure the gear needed to shoot them. 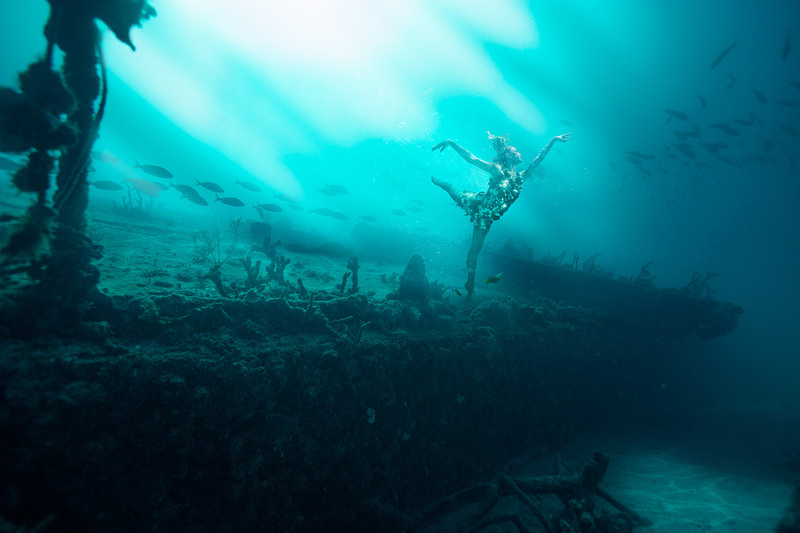 I also realized the wrecks were in water over 100’ deep in some instances. To prolong my dive time safely, I needed to get Nitrox certified along the way. I wanted a great fashion stylist with access to interesting wardrobe and props. Both props and wardrobe would be subjected to saltwater or chlorine, which could potentially ruin them. We needed great make up and hair and knew this would be a major factor to contend with, both for aesthetic and technical reasons. Additionally, I needed talent that would be good with holding their breath, opening their eyes underwater and acting naturally while contending with being in the water for prolonged periods of time. After a year of homework, gathering the right gear, testing in pools and the ocean, I had the opportunity I’d been looking for. 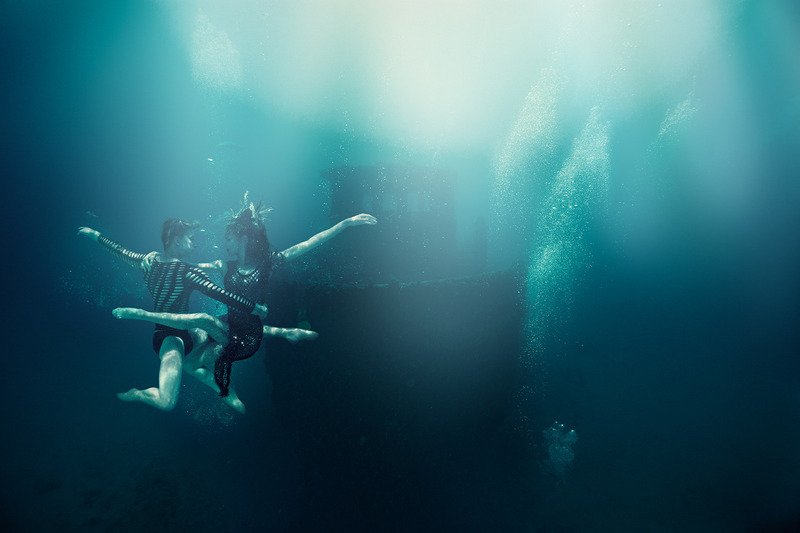 I was asked by an editorial client if I’d be interested in photographing members of the Miami City Ballet for an editorial UNDERWATER. 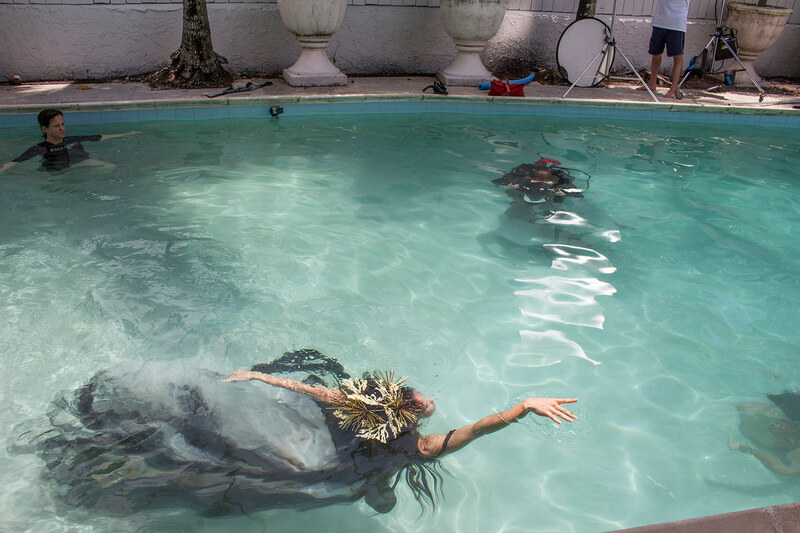 We had talked about doing an underwater fashion story in the past, but I wanted it to be more than girls swishing around in gowns. I presented the publisher and editor with my idea and a couple of practice shots of my wife, combined with the wrecks. They loved the direction, and we were on! I knew that the dancers could give me the right form I was looking for and that they are very disciplined with control of their bodies, but I had no idea if they could work in the water. I followed up with them sending over a “How to Guide” to holding your breath for longer periods of time, and asked them to read up and practice. The day of the shoot finally arrived, I had decided to shoot the wrecks prior to the dancers, keeping in mind how I would like to position the dancers in post. I decided that shooting the dancers in a pool in Miami, and editing them into the wrecks, would be the safest way of producing this. Additionally, we had a very small editorial budget to work with. Hiring all the support services I would need to get my dancers 100’ down and onto a wreck in the ocean, while safely posing, wasn’t the right approach in this instance. Even so, shooting around and under the water is not very forgiving. Every aspect has to be thought out as little mistakes can exponentially grow and become major issues. Our shoot came of seamlessly. We used the sun as our main source throughout the day with strategically placed reflectors to maintain an organic consistent look to match what we were getting in the ocean on the wrecks. I take my hat off to my retoucher Christine Craig, who is much more a partner in vision, than a retoucher. We’ve been working together for over five years, mostly over the shared networked internet tunnel we have created so we can each see what the other is working on in real-time. She’s lived in various locations around the northeast since she started as my intern in Miami and has since settled in SC. Christine had been excited by the idea of shooting underwater from day one. We did research and tests to come up with the best approach to match our vision. She’s the kind of girl who doesn’t give up easily and every time I challenged her, she exceeded my expectations. I’m lucky to have her and so are my clients. I started this as a personal project and I was fortunate to have it evolve into an editorial that came with support from the magazine and amazing talent. The editor on set was wonderful and took care of the crew, talent, and politics. The dancers were enthusiastic and very willing to jump through hoops to make this happen. My support staff worked for free or a small stipend, they believed in the idea and wanted to be part of creating some cool and unique images. I take my Hat off for all involved, Thank you! To see more of George Kamper’s work go to his website and Altpick page. 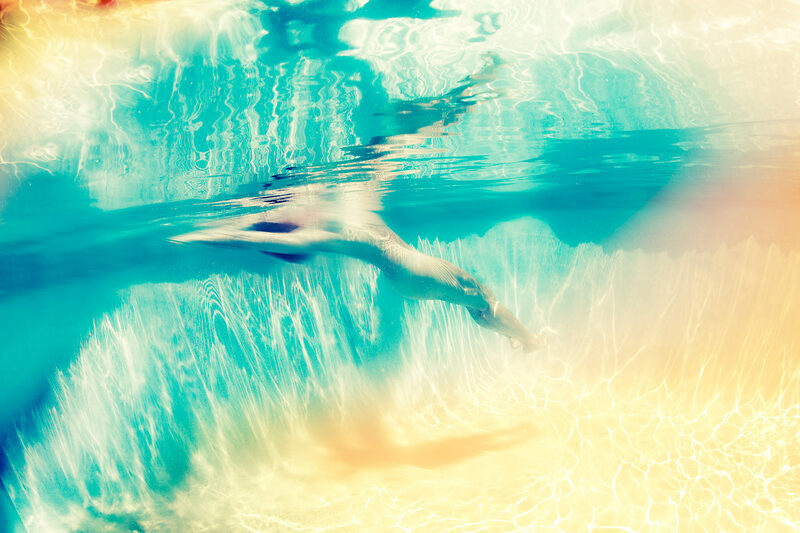 This entry was posted in Altpick, Art, Photography and tagged christine craig, dance, environment, fashion, george kamper, go pro, lifeguard, miami city ballet, nicaragua, nitrox, ocean, olympics, still life, swimming pools, travel, underwater, water, wrecks. Bookmark the permalink.